This is a corporate identity that I created for Innovative Technology Consultants (ITC), a small technology company that specialises in setting up small business servers for new companies. The first part of the job was to create a new logo for the company. They already had an existing logo and colour scheme so the plan was to simply update the style so that it was more stylised and flexible. Using the existing logo as a guide I set about creating a simplistic design that would work in a variety of situations. 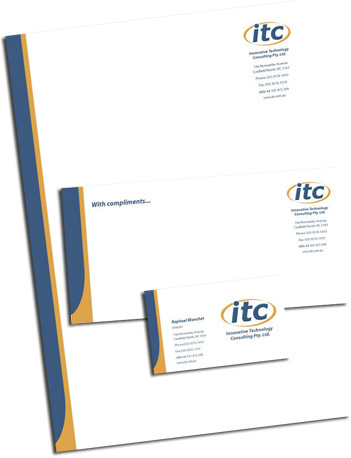 Once the logo was finalised I set about creating a full set of corporate stationery. This included a letterhead, with compliments slip and business cards.